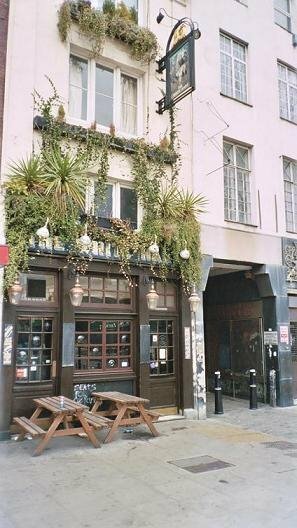 This is the White Hart public house at 89 Whitechapel High Street. At approximately 11.45pm on August 6th 1888, a 39 year old prostitute by the name of Martha Tabram, together with a collegue, Mary Ann "Pearly Poll" Connelly, parted company with each other in front of this public house. They had spent the last hour and three quarters in the company of two soldiers who had treated them to drinks in several pubs in the area. Now Martha went with one of the soldiers up George Yard, through the archway that can be seen in the photo, while Pearly Poll took the other one to nearby Angel Alley for what she called "immoral purposes". It was the last time Martha was seen alive. I had lunch at the White Hart back in 2003 during a self guided walking tour of Ripperland. It was a pretty nice place, very atmospheric. I am surprised that the commercial Ripper walking tours do not stop off there now that the Ten Bells is no longer permitting large groups of "Ripper walkers" to enter. Ripper suspect George Chapman once lived in the basement and there is a Jack the Ripper sing on the pub.